One of my favorite spectacles in Montreal featured a man in a box who popped a large rubber band off his head using his facial muscles. This was the opening piece of Dance Me to the End On/Off of Love by Danish dance company Granhoj Dans. The show paired Leonard Cohen’s minimalistic, moody songs with the company-specific obstruction technique. Dancers were restricted from full movement in contrast or concert with the alternately sensuous and restrained lyrics of Cohen. The result was a moving, creative, and funny work that awed the house to its feet. This wonderful piece is coming back to Montreal and I talked to company founder, head, and dancer Palle Granhoj about the upcoming show. Rachel Levine (RL): This is your second trip back to Montreal with this show. Is anything different from the earlier production? Palle Granhoj (PG): No it’s exactly the same. And I am looking forward to coming back. RL: What inspired you to work with the music of our hometown hero Leonard Cohen? PG: It’s a quite long story. It started 15 years ago when I did a small piece where I used the song “Dance Me to the End of Love.” That was for a guy that later, to make story very short, got brain cancer and asked me to do a piece for him before he died, so I did. I felt like I had to do it for him. That was the start of this idea of making this piece. Some years later, I started to go much more into Leonard Cohen’s work and immediately found out that he was much, much too big and too huge a star than I could ever touch. All these people had done many things with his work, so I left the idea for a long time. In the end, I was longing so much to go back to his universe, which also gets at the idea of longing, how I was longing for his universe. I went back and decided to do this piece. I had to try to do the songs and lyrics in a way that had not been done before. I not sure if I would succeed. At least I tried. I considered Dance Me to the End On/Off of Love a self-portrait. 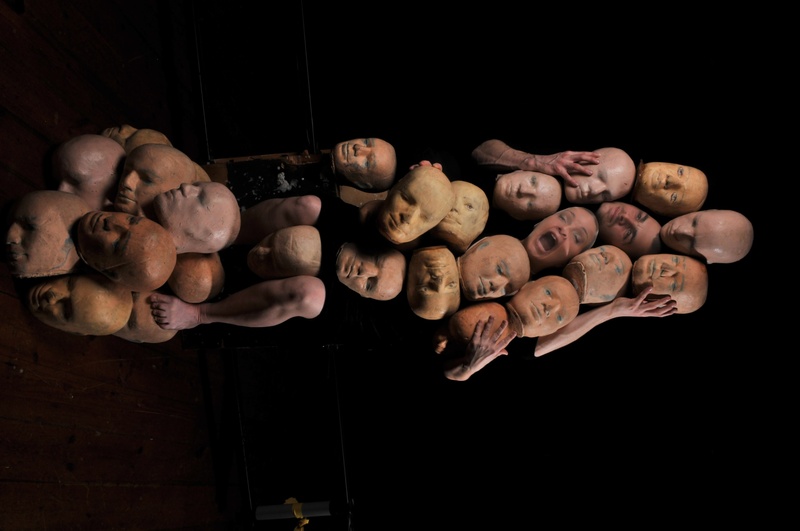 I looked at my previous work for 20 years, and I used the images from previous pieces, all the mannequin heads and the opening with the elastic. Those were ideas I used before and I reused them with the music of Leonard Cohen. This piece took me five years to make, but it also took 50 years and a few months because it includes all the experiences I’ve had in previous works. It includes all the other productions. RL: Is there a connection between Cohen and the obstruction technique you use. I still think about that first piece with the rubber band. PG: That is my use of the Cohen universe. For me, only for me, there is a strong connection to his longing. He used the idea of longing as a creative tool, for creating his words and music. In my way, I have created the obstruction method — that is, to put limitations and obstruction on movement that is already created. If you restrict a beautiful movement, you see the dancer aim or try to do the full movement, even though he is not able to do it. I see that creates a tremendous energy and expression that I combine with the longing. The longing concept for Cohen, that’s how he makes all this fantastic poetry about love and all these things. I am humble, combining my small work with his. RL: You dance in the piece quite a lot. Is it difficult to run the company, choreograph, and dance? It reminds me of film directors who also write and star in their shows. Does each require a different hat? PG: That’s a good question. That’s what I’ve always been doing. I have no idea how it is not to do that. The company is a collective – a commune. People have said to me it’s like that. It creates a lot of extra energy for working. They are all freelance artists, 30 people connected in this system. RL: Tell me about the obstructive method you use with the dancers. Do they usually join the company enthusiastic to try this method or is it a shock and a change for them? PG: I’ve only met people who love to do it. Also, for them, it reveals new ways to move and creates new ways for them to be creative in the process. There was one time when I did a piece for classical company and they couldn’t do it at first. The arabesque — you can not take an arm away from an arabesque, because to them it wasn’t an arabesque. So they are trained and educated in the whole picture. When they found out that you could deconstruct the whole picture, it was easier to work for them. My own people — they’re dancers who are very open and educated in a way that they are open to all kinds of techniques. RL: Can you walk me through how you create a piece using this method? PG: Every day I ask the dancers to do their own material if I do not know them. Normally they go in and rehearse and create something. The rest of the day, I put it into small pieces, and put all these obstructions on that material. New ideas come up. I have no idea what they are bringing in. I have to create on top of what they make. A lot of ideas and things come up that I could not have imagined. If I created it beforehand, I could not get those ideas. The dancers are very involved. The next day, new material, new obstructions. RL: Is there anything else you would like to say? PG: Last time, coming to perform in Montreal, I have never been that nervous before. Leonard Cohen, he’s yours. He comes from Montreal, so performing for you guys, you must be specialists. I was so nervous. And then the reaction from audience was so fantastic. But I missed one person in the audience… and that was a guy called Leonard Cohen. He was on tour in the states and could not come. So of course, this time, it’s a dream if he was sitting there. That could be fantastic. If he comes, I hope no one will tell me, I will be so nervous. And even if he is not coming, everyone is looking forward to coming back. Dance Me to the End On/Off of Love is at the Centaur Theatre (453 St Francois Xavier) on November 19 to 22. 8 p.m. $28-37.